The folowing is the recipe for the 2014 CWA Baking Contest. Heat oven to 350˚. For crumb mixture, in a small mixer bowl, combine flour, oats, sugar, butter, baking soda and salt. Beat at low speed, scraping bowl often, until mixture is crumbly – 1 to 2 minutes. Stir in nuts. Reserve 3/4 cup of the crumb mixture. Press remaining crumb mixture on bottom of greased and floured 9 inch square baking pan. Bake for 12 to 17 minutes, or until lightly browned. For filling, spread caramel topping evenly over hot crust. Sprinkle nuts, marshmallows and chocolate chips over top. Crumble 3/4 cup reserved crumb mixture over top. Continue baking 20 to 25 minutes, or until crumb mixture is lightly browned. Cover, refrigerate 1 to 2 hours, or until firm. Cut into bars. Contest is open to Grange members, children and grandchildren of members and Junior Grange members. 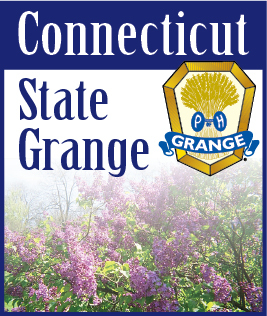 Judging for the baking contest is held in the Subordinate Grange with the winners baking again for the State Judging at Let's Celebrate in June at Cheshire Grange Hall. PRIZES FOR THE CRAFT AND BAKING CONTESTS AT THE STATE LEVEL WILL BE: 1st Place - $10.00; 2nd Place -$5.00; 3rd Place - $3.00.